If DTC P117A is displayed with other DTC, first perform the trouble diagnosis for the other DTC. Refer to EC-94, "DTC Index". P117A AIR FUEL RATIO B1 (AIR FUEL RATIO B1) ECM detects a lean/rich air fuel ratio state in any cylinder for a specified length of time. If DTC Confirmation Procedure has been previously conducted, always perform the following before conducting the next test. Will CONSULT be used? YES >> GO TO 3. Select вЂњCOOLANT TEMP/SвЂќ in вЂњDATA MONITORвЂќ mode of вЂњENGINEвЂќ using CONSULT. Make sure that вЂњCOOLANT TEMP/SвЂќ indicates more than 80В°C (176В°F). Select вЂњSYSTEM 1 DIAGNOSIS B B1вЂќ and вЂњSYSTEM 1 DIAGNOSIS A B1вЂќ in вЂњDATA MONITORвЂќ mode of вЂњENGINEвЂќ using CONSULT. Drive vehicle under the following conditions for at least 5 consecutive seconds. Drive the vehicle at approximately 88 km/h (55MPH) allows easy diagnosis. Keep the accelerator pedal as possible during crusing. Check вЂњSYSTEM 1 DIAGNOSIS A B1вЂќ indication. Is вЂњCMPLTвЂќ displayed? YES >> GO TO 5. Is 1st trip DTC detected? YES >> Proceed to EC-364, "Diagnosis Procedure". Start the engine and warm it up to normal operating temperature. Stop engine and check the following for connection. Start engine and let it idle. Listen for an intake air leak after the mass air flow sensor. Stop engine and visually check exhaust tube, three way catalyst and muffler for dents connection. Listen for an exhaust gas leak before three way catalyst (manifold). Check fuel pressure. Refer to EC-143, "Work Procedure". Check вЂњMASS AIR FLOWвЂќ in вЂњDATA MONITORвЂќ mode of вЂњENGINEвЂќ using CONSULT. For specification, refer to EC-486, "Mass Air Flow Sensor". Check mass air flow sensor signal in Service $01 using GST. NO >> Check connectors for rusted terminals or loose connections in the mass air flow sensor circuit or grounds. Refer to EC-187, "Diagnosis Procedure". Check that each circuit produces a momentary engine speed drop. NO >> Perform trouble diagnosis for fuel injector, refer to EC- 450, "Component Function Check". Perform the following procedure in a place with no combustible objects and good ventilation. Confirm that the engine is cooled down and there are no fire hazards near the vehicle. Disconnect all fuel injector harness connectors. Remove fuel tube assembly. Refer to EM-40, "Removal and Installation". Keep fuel hose and all fuel injectors connected to fuel tube. Disconnect all ignition coil harness connectors. Prepare pans or saucers under each fuel injector. Crank engine for approximately 3 seconds. Fuel should be sprayed evenly for each fuel injector. Fuel must not drip from the tip of fuel injector. NO >> Replace fuel injector. Refer to EM-40, "Removal and Installation". Perform the following steps in a well-ventilated area with no combustibles. Remove fuel pump fuse from IPDM E/R to release fuel pressure. CONSULT must not be used to release fuel pressure. It develops again during the following steps, if released by using CONSULT. After an engine stall, crank the engine two or three times to release all the fuel pressure. Disconnect all the harness connectors of ignition coil to prevent electric discharge from occurring in ignition coil. Remove ignition coil assembly and spark plug of cylinder. Refer to EM-45, "Removal and Installation". 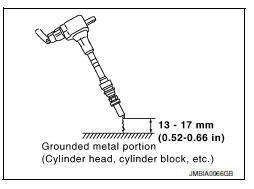 Allow a 13-17mm (0.52-0.66 in) spacing between spark plug and grounded metal portion as shown in the figure to fix the ignition coil with a rope or an equivalent. Crank the engine for approximately 3 seconds to see if sparking occurs between spark plug and the grounded metal portion. The discharge voltage becomes 20 kV or higher. Therefore, always stay away from the spark plug and ignition coil at least 50 cm (19.7 in) during the inspection. Leaving a space of more than 17mm (0.66 in) may damage the ignition coil. When the gap is less than 13 mm (0.52 in), a the spark might be generated even if the coil is malfunctioning. YES >> Check intermittent incident. Refer to GI-39, "Intermittent Incident". NO >> Check pistons, piston rings, valves, valve seats and cylinder head gaskets. Is the inspection result normal? YES >> Replace fuel filter and fuel pump assembly. Refer to FL-6, "Removal and Installation". Disconnect spark plug and connect a non-malfunctioning spark plug. Crank engine for approximately 3 seconds, and recheck whether spark is generated between the spark plug and the grounded metal portion. NO >> Check ignition coil, power transistor and their circuits. Refer to EC-456, "Component Function Check". Check the initial spark plug for fouling, etc. Is the inspection result normal? YES >> 1. Repair or clean spark plug. Refer to EM-45, "Removal and Installation". NO >> Replace spark plug(s) with standard type one(s). For spark plug type, refer to EM-118, "Spark Plug". Reconnect the initial spark plugs. Crank engine for approximately 3 seconds, and recheck whether spark is generated between the spark plug and the grounded portion.